Worried about winter heating bills? Or just wishing your home wasn’t so drafty? We’ve already covered the perfect DIY solution #1: installing storm doors. What’s the perfect DIY solution #2? Installing storm windows. They alone can save you between 12 and 33 percent on your heating costs and are much cheaper than replacement windows. Plus, installing storm windows is easy, with our expert how-to advice. Determine what type of storm windows you’d like – interior or exterior. Exterior models come with solid windows and screens in frames that attach directly to an existing window. Interior storm windows are usually seasonal products that you install every winter. They snap or clip into your interior windowsill but do not have adjustable glass panes or screens. Exterior storm windows are the most common. Frames are made from wood, aluminum or vinyl and offer extra protection to your existing windows. They help them last longer and require less maintenance to the paint and caulk. Most have low emissivity glass (Low-E), which keeps thermal heat in during the winter and infrared heat out during the summer. Take a series of measurements of the inside of your existing window, at the bottom, top and middle of the frame. Why? The window frame may not be straight. Use the smallest measurement to order your storm windows. Measure the height of the frame from the outside of your window. Multiple positioning stops so you can raise or lower the panes to where you want. Quality weather stripping to help stop heating/cooling loss. Pre-drilled holes for quicker installation. Easy-to-clean removable half pane glass and screens to make spring cleaning easier. Storm windows come with weep holes installed at the bottom. Drill matching holes in the bottom exterior windowsill. This will allow condensation to escape. Next, scrap and paint the exterior frame before installing the new window. Manufacturers recommend applying Butyl caulk, a rubber-based sealant that is good for outdoor installations like siding and gutters. It is a little uncooperative to work with, but it seals better than a silicone caulk. Apply it to the back of the storm window before installing to the exterior frame. You may need an extra set of hands to help hold the storm window while you mount it. First center the window then screw it in at top. Close the bottom sash and then screw the sides to the exterior frame. There will be an adjustable expander at the bottom of your storm windows. Tap it down tight against the windowsill and you are done. Be sure to check your storm windows for condensation during the next cold snap. Leaks from your interior windows can cause moisture build up. This is no problem since the storm window has weep holes, but you may want to follow up with new weather stripping on your interior sill to plug possible air leaks. Cutting down on heating bills is always a challenge. Improving your home’s insulation, plugging air leaks and installing storm windows will go a long way to take a bite out of that next bill. Next time the cold wind blows and you sit warm inside, remember to thank your storm windows. Everyone likes a nice pat on the back from time to time. From ladders and drills to caulking saws, our expert staff is always on hand to help you find the right equipment to tackle your next DIY project. For more helpful tips on how to keep things warm at your house check out our blog, 3 Easy Economical Ways to Winterize Your Home. As always, if you have any questions about what to choose, pricing or how-to’s, don’t hesitate to contact us. Stop by our store — we’re open seven days a week. Sitting in front of a blazing fire during the winter is one of life’s joys. A fireplace that offers warmth and comfort must be properly maintained, so it doesn’t pose a hazard to your family. Give yourself peace of mind by having your both your fireplace and chimney inspected and cleaned. Chimney fires are caused by a buildup of creosote, which is the byproduct of unburnt wood. It adheres to the inside of the chimney or flue and can ignite with a spark. An inspection will determine the amount of soot and creosote coating the interior of the chimney. If the layer is over 1/8-inch thick, then avoid using the fireplace until it can be cleaned. From the top down – You would use the chimney brush and extenders down into the chimney from the roof, scrubbing the sides to loosen debris. From the bottom up – You extend the brush up into the chimney and flue to remove the soot and creosote. Tag team method – With a rope pulley system, one person is on the roof and the other is at the base of the fireplace. Together they pull the chimney brush back and forth on the pulley, cleaning the sides. If you are not sure, call a professional chimney sweep – Determining the type and thickness of the soot is important. Simply scrape some off the side of the chimney to ascertain what kind of cleaning is needed. If you are unsure about tackling the job yourself then call in a professional. A reputable chimney sweep is licensed by the Chimney Safety Institute of America and the cost is estimated at $150-$200. Soot can get everywhere, so cover up – This DIY project can be messy so be sure to cover your floors and furniture with drop cloths. Wear old clothes, a dust mask and safety goggles. Place a drop cloth in the bottom of the fireplace. You may even want to create a “tent” around the fireplace if you worry about covering your house in soot. 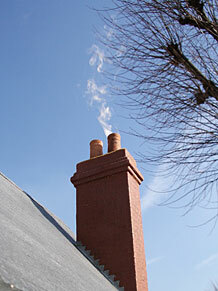 Your chimney may have houseguests – Lay on your back and look up into the chimney and flue with a flash light. Don’t be surprised to find animals like birds and squirrels nesting in there. If you do you will need to remove them before continuing. Glazed, hardened creosote may need a professional touch to remove – Whichever method appeals to you, be sure to get as much soot and creosote off the walls as possible. Use a shop vacuum to gather the falling debris as you work. If the creosote on the walls has hardened into a glaze you may need to seek professional help in getting it off. Scrubbing will not remove this type layer. Don’t forget to trim back tree limbs – Inspect the outside of your chimney. Look for any loose or cracked bricks and deteriorating mortar. If you have tree limbs that are covering your chimney now is the time to trim them back. Make sure the damper is working properly – From the fireplace, shine your flashlight upward to make sure the damper is working properly. Be sure to wear your safety goggles since debris will often float back down and land on the damper ledge. Use your chimney brush to clean this area. Get out the shop vac for clean-up – After getting as much soot and creosote off the walls, vacuum the fireplace and drop cloths. Be careful to clean up any debris that may have escaped the hearth before removing the tarps on your furniture. By inspecting and cleaning your chimney and fireplace once a year in addition to burning well-seasoned wood, you can greatly reduce the chances of having an accidental fire in your home. Keeping your family safe and warm this winter only takes a little elbow grease and a good chimney brush. You can even whistle tunes from Mary Poppins while you work … if this helps! From ladders and chain saws to shop vacs, our expert staff is always on hand to help you find the right equipment for your home projects. 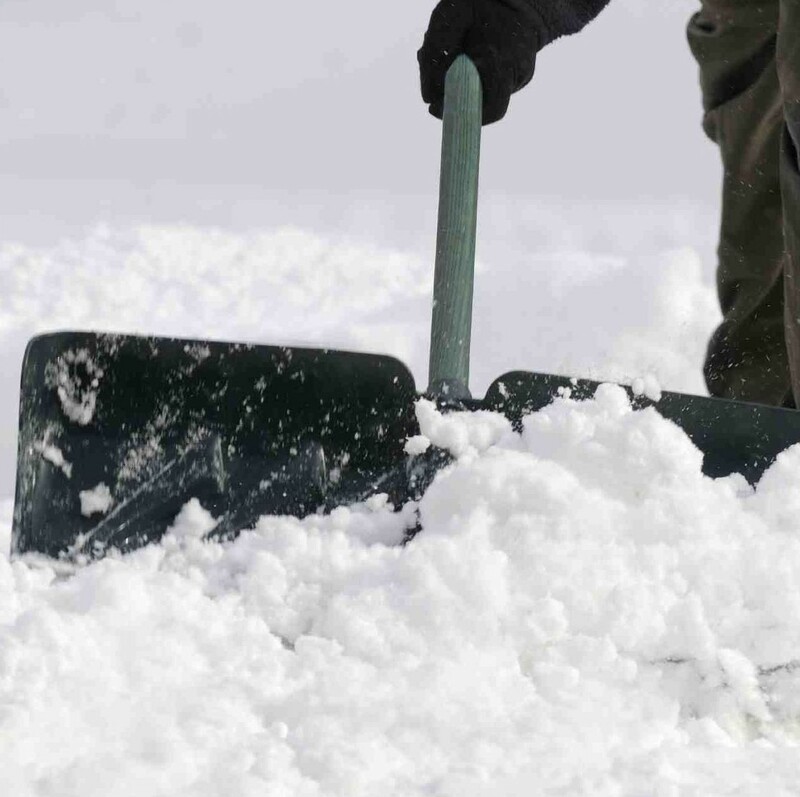 For more helpful tips on how to get your home ready for the cold temps, check our blog, 3 More Ways to Prepare Your Home for Winter. As always, if you have any questions about what to choose, pricing or how-to’s, don’t hesitate to contact us. Stop by our store — we’re open seven days a week. This winter, with the high cost of heating on everyone’s mind, improve your home’s heating efficiency by finding ways to stop heat loss and to better distribute the warm air coming out of your furnace and fireplace. Some of these solutions are right in front of you. Protect the Front Door – Entryway doors can be costly and storm doors keep rain and snow off of them, extending their life. Add Security – A locked storm door can add protection when you open your front door to a stranger. Protect Visitors – There’s nothing worse than opening the front door and getting a face full of rain or snow. It’s nice to have a buffer before venturing out. Some front door manufacturers will recommend not using a storm door, especially if it will be receiving several hours of daily direct sunlight. Heat can build up between the two doors. Install a storm door with vents to allow the heat to escape. Add UV protective tinting to all glass storm doors. During the spring and summer, storm door screens keep pests out and cool breezes coming in. In the fall and winter, swap out the screen for the glass panel. Just remove the plastic clips on the top, bottom and sides of the screen and gently pop it out. The glass insert slides in and you finish by replacing the clips around all sides. Clean the screen and store it to await the swap out in the spring. Most ceiling fans have a switch on the motor assembly that you flip to change the turning direction. In the summer, blades that turn counter-clockwise produce a cool breeze that blows directly down. In the winter, blades that turn clockwise draw air up and out, helping to recirculate the warmer air sitting at the ceiling. Spread Warm Air Around – Hot air rises and often leaves pockets of cold air throughout rooms. Ceiling fans redistribute the warm air from a central source, such as a fireplace or wood stove, to reach other areas of the house. It’s Hot Upstairs and Cold Downstairs – If you own a two story home with a central open staircase, you know how warm it can get upstairs while the rooms downstairs remain cold. Install a ceiling fan at the top of the stairs. It can help redirect some of the heat rising upstairs back to the ground floors. Check for air drafts around windows and doors. 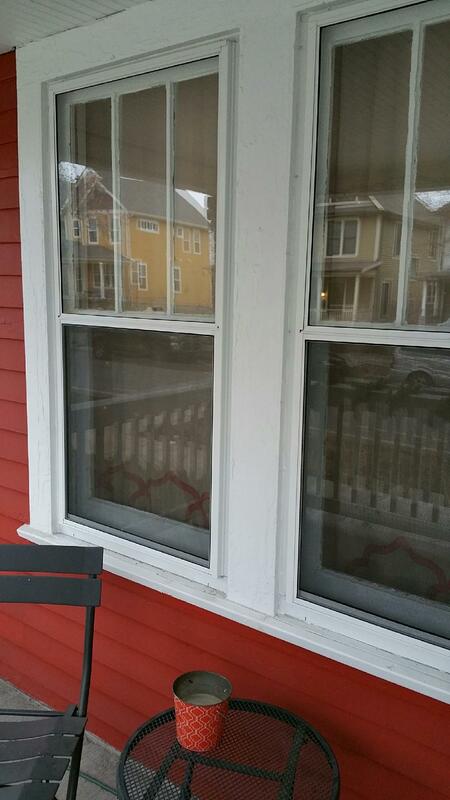 Caulk around windows to help seal them. Weather stripping can help eliminate leaks as well. For drafty patio and French doors – and also for windows – try installing insulated drapes that you close at night to keep the heat from escaping. The goal is to stay warm and toasty this winter. Look for anything around your home that can eat into your energy efficiency. Every little bit helps. These simple DIY repairs will help you focus on more important things like how many marshmallows are going to go into your hot chocolate. From ladders to insulation blowers, our expert staff is always on hand to help you find the right tools and equipment for your home improvements. For more helpful tips on how to keep the cold out, check our blog, Cold Weather Basics: Winterizing Window, Doors and Vents. As always, if you have any questions about what to choose, pricing or how-to’s, don’t hesitate to contact us. Stop by our store — we’re open seven days a week.